We introduce an efficient computational method for generating dense and low distortion maps between two arbitrary surfaces of same genus. Instead of relying on semantic correspondences or surface parameterization, we directly optimize a variance-minimizing transport plan between two input surfaces that defines an as-conformal-as-possible inter-surface map satisfying a user-prescribed bound on area distortion. 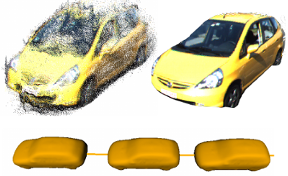 The transport plan is computed via two alternating convex optimizations, and is shown to minimize a generalized Dirichlet energy of both the map and its inverse. Computational efficiency is achieved through a coarse-to-fine approach in diffusion geometry, with Sinkhorn iterations modified to enforce bounded area distortion. The resulting inter-surface mapping algorithm applies to arbitrary shapes robustly, with little to no user interaction. In this paper we present a robust remeshing-free cutting algorithm on the basis of the eXtended Finite Element Method (XFEM) and fully implicit time integration. One of the most crucial points of the XFEM is that integrals over discontinuous polynomials have to be computed on subdomains of the polyhedral elements. 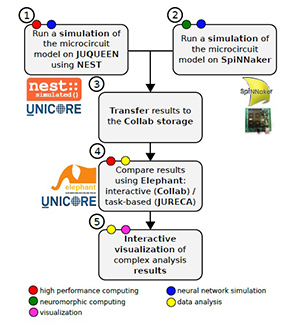 Most existing approaches construct a cut-aligned auxiliary mesh for integration. In contrast, we propose a cutting algorithm that includes the construction of specialized quadrature rules for each dissected element without the requirement to explicitly represent the arising subdomains. Moreover, we solve the problem of ill-conditioned or even numerically singular solver matrices during time integration using a novel algorithm that constrains non-contributing degrees of freedom (DOFs) and introduce a preconditioner that efficiently reuses the constructed quadrature weights. Our method is particularly suitable for fine structural cutting as it decouples the added number of DOFs from the cut's geometry and correctly preserves geometry and physical properties by accurate integration. Due to the implicit time integration these fine features can still be simulated robustly using large time steps. As opposed to this, the vast majority of existing approaches either use remeshing or element duplication. Remeshing based methods are able to correctly preserve physical quantities but strongly couple cut geometry and mesh resolution leading to an unnecessary large number of additional DOFs. Element duplication based approaches keep the number of additional DOFs small but fail at correct conservation of mass and stiffness properties. We verify consistency and robustness of our approach on simple and reproducible academic examples while stability and applicability are demonstrated in large scenarios with complex and fine structural cutting. Supervised deep learning often suffers from the lack of sufficient training data. Specifically in the context of monocular depth map prediction, it is barely possible to determine dense ground truth depth images in realistic dynamic outdoor environments. When using LiDAR sensors, for instance, noise is present in the distance measurements, the calibration between sensors cannot be perfect, and the measurements are typically much sparser than the camera images. In this paper, we propose a novel approach to depth map prediction from monocular images that learns in a semi-supervised way. 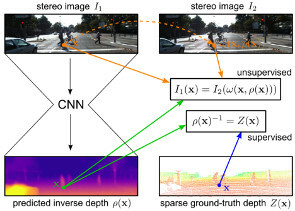 While we use sparse ground-truth depth for supervised learning, we also enforce our deep network to produce photoconsistent dense depth maps in a stereo setup using a direct image alignment loss. In experiments we demonstrate superior performance in depth map prediction from single images compared to the state-of-the-art methods. 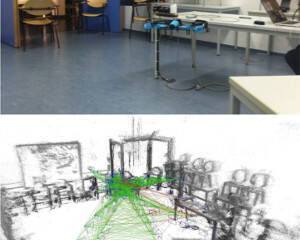 Visual scene understanding is an important capability that enables robots to purposefully act in their environment. In this paper, we propose a novel deep neural network approach to predict semantic segmentation from RGB-D sequences. The key innovation is to train our network to predict multi-view consistent semantics in a self-supervised way. At test time, its semantics predictions can be fused more consistently in semantic keyframe maps than predictions of a network trained on individual views. 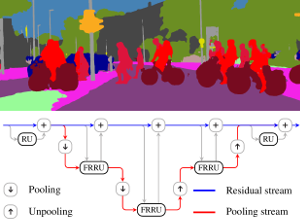 We base our network architecture on a recent single-view deep learning approach to RGB and depth fusion for semantic object-class segmentation and enhance it with multi-scale loss minimization. 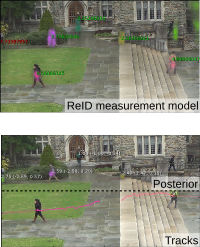 We obtain the camera trajectory using RGB-D SLAM and warp the predictions of RGB-D images into ground-truth annotated frames in order to enforce multi-view consistency during training. At test time, predictions from multiple views are fused into keyframes. We propose and analyze several methods for enforcing multi-view consistency during training and testing. We evaluate the benefit of multi-view consistency training and demonstrate that pooling of deep features and fusion over multiple views outperforms single-view baselines on the NYUDv2 benchmark for semantic segmentation. 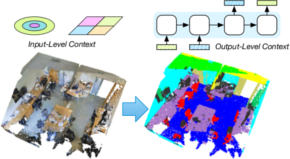 Our end-to-end trained network achieves state-of-the-art performance on the NYUDv2 dataset in single-view segmentation as well as multi-view semantic fusion. In this paper we present a novel Smoo­thed Particle Hy­dro­dy­na­mics (SPH) method for the efficient and stable simulation of incompressible fluids. The most efficient SPH-based approaches enforce incompressibility either on position or velocity level. However, the continuity equation for incompressible flow demands to maintain a constant density and a divergence-free velocity field. We propose a combination of two novel implicit pressure solvers enforcing both a low volume compression as well as a divergence-free velocity field. While a compression-free fluid is essential for realistic physical behavior, a divergence-free velocity field drastically reduces the number of required solver iterations and increases the stability of the simulation significantly. Thanks to the improved stability, our method can handle larger time steps than previous approaches. This results in a substantial performance gain since the computationally expensive neighborhood search has to be performed less frequently. 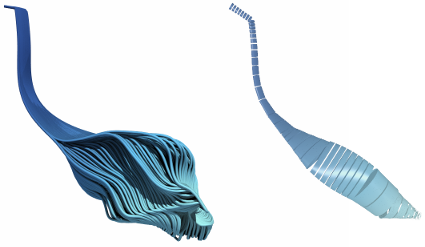 Moreover, we introduce a third optional implicit solver to simulate highly viscous fluids which seamlessly integrates into our solver framework. Our implicit viscosity solver produces realistic results while introducing almost no numerical damping. 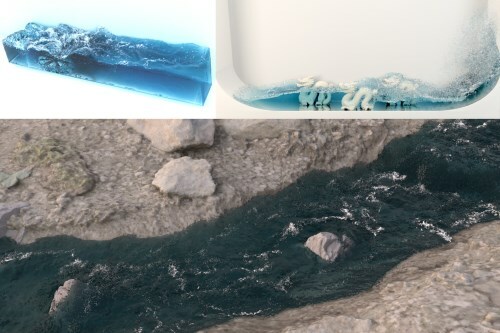 We demonstrate the efficiency, robustness and scalability of our method in a variety of complex simulations including scenarios with millions of turbulent particles or highly viscous materials. Understanding multi-dimensional data and in particular multi-dimensional dependencies is hard. Information visualization can help to understand this type of data. Still, the problem of how users gain insights from such visualizations is not well understood. Both the visualizations and the users play a role in understanding the data. In a case study, using both, a scatterplot matrix and a HyperSlice with six-dimensional data, we asked 16 participants to think aloud and measured insights during the process of analyzing the data. The amount of insights was strongly correlated with spatial abilities. 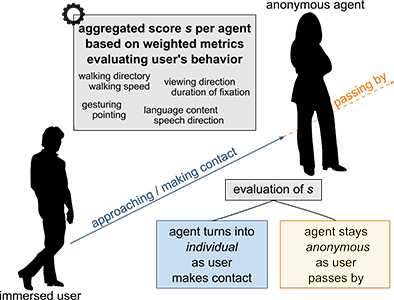 Interestingly, all users were able to complete an optimization task independently of self-reported understanding of the data. 3D-Polarized Light Imaging (3D-PLI) provides data that enables an exploration of brain fibers at very high resolution. However, the visualization poses several challenges. Beside the huge data set sizes, users have to visually perceive the pure amount of information which might be, among other aspects, inhibited for inner structures because of occlusion by outer layers of the brain. We propose a clustering of fiber directions by means of spherical harmonics using a level-of-detail structure by which the user can interactively choose a clustering degree according to the zoom level or details required. Furthermore, the clustering method can be used for the automatic grouping of similar spherical harmonics automatically into one representative. An optional overlay with a direct vector visualization of the 3D-PLI data provides a better anatomical context. Honorable Mention for Best Short Paper! 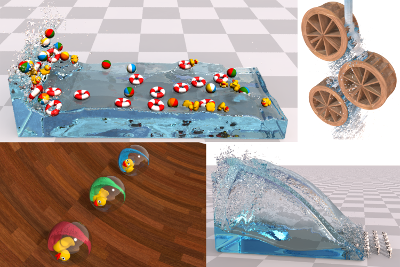 In this paper, we present the novel concept of density maps for robust handling of static and rigid dynamic boundaries in fluid simulations based on Smoothed Particle Hydrodynamics (SPH). In contrast to the vast majority of existing approaches, we use an implicit discretization for a continuous extension of the density field throughout solid boundaries. Using the novel representation we enhance accuracy and efficiency of density and density gradient evaluations in boundary regions by computationally efficient lookups into our density maps. The map is generated in a preprocessing step and discretizes the density contribution in the boundary's near-field. In consequence of the high regularity of the continuous boundary density field, we use cubic Lagrange polynomials on a narrow-band structure of a regular grid for discretization. This strategy not only removes the necessity to sample boundary surfaces with particles but also decouples the particle size from the number of sample points required to represent the boundary. Moreover, it solves the ever-present problem of particle deficiencies near the boundary. In several comparisons we show that the representation is more accurate than particle samplings, especially for smooth curved boundaries. We further demonstrate that our approach robustly handles scenarios with highly complex boundaries and even outperforms one of the most recent sampling based techniques. 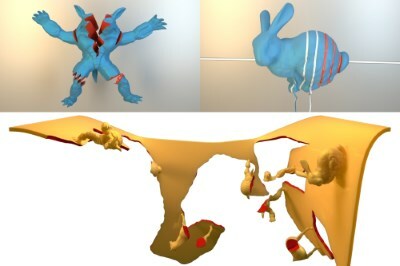 The physically-based simulation of mechanical effects has been an important research topic in computer graphics for more than two decades. Classical methods in this field discretize Newton's second law and determine different forces to simulate various effects like stretching, shearing, and bending of deformable bodies or pressure and viscosity of fluids, to mention just a few. Given these forces, velocities and finally positions are determined by a numerical integration of the resulting accelerations. 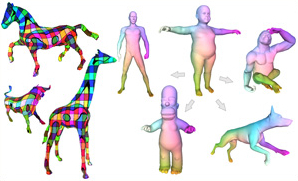 In the last years position-based simulation methods have become popular in the graphics community. 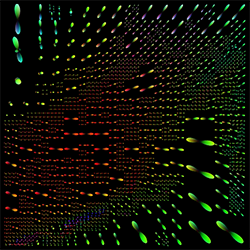 In contrast to classical simulation approaches these methods compute the position changes in each simulation step directly, based on the solution of a quasi-static problem. 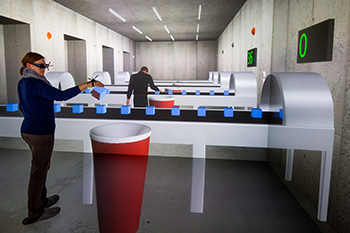 Therefore, position-based approaches are fast, stable and controllable which make them well-suited for use in interactive environments. However, these methods are generally not as accurate as force-based methods but provide visual plausibility. 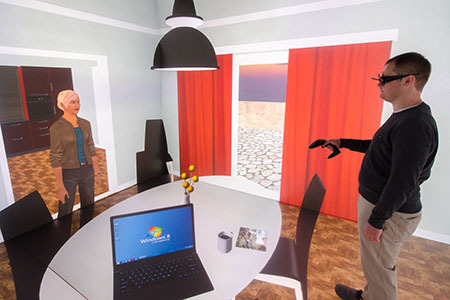 Hence, the main application areas of position-based simulation are virtual reality, computer games and special effects in movies and commercials. In this tutorial we first introduce the basic concept of position-based dynamics. Then we present different solvers and compare them with the variational formulation of the implicit Euler method in connection with compliant constraints. We discuss approaches to improve the convergence of these solvers. Moreover, we show how position-based methods are applied to simulate elastic rods, cloth, volumetric deformable bodies, rigid body systems and fluids. We also demonstrate how complex effects like anisotropy or plasticity can be simulated and introduce approaches to improve the performance. Finally, we give an outlook and discuss open problems. TL;DR: Collected & annotated laser detection dataset. 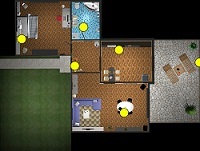 Use window around each point to cast vote on detection center. We introduce the DROW detector, a deep learning based detector for 2D range data. Laser scanners are lighting invariant, provide accurate range data, and typically cover a large field of view, making them interesting sensors for robotics applications. So far, research on detection in laser range data has been dominated by hand-crafted features and boosted classifiers, potentially losing performance due to suboptimal design choices. We propose a Convolutional Neural Network (CNN) based detector for this task. 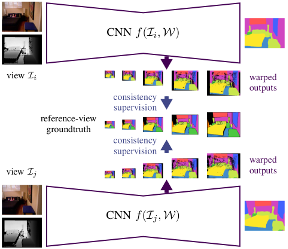 We show how to effectively apply CNNs for detection in 2D range data, and propose a depth preprocessing step and voting scheme that significantly improve CNN performance. We demonstrate our approach on wheelchairs and walkers, obtaining state of the art detection results. Apart from the training data, none of our design choices limits the detector to these two classes, though. We provide a ROS node for our detector and release our dataset containing 464k laser scans, out of which 24k were annotated. 2017, Los Angeles, CA, USA / Evan Suma Rosenberg, David M.
Scene visibility - the information of which parts of the scene are visible from a certain location—can be used to derive various properties of a virtual environment. 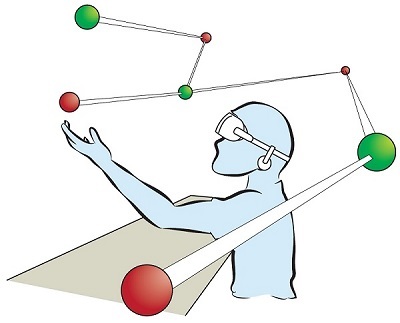 For example, it enables the computation of viewpoint quality to determine the informativeness of a viewpoint, helps in constructing virtual tours, and allows to keep track of the objects a user may already have seen. 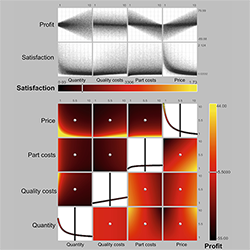 However, computing visibility at runtime may be too computationally expensive for many applications, while sampling the entire scene beforehand introduces a costly precomputation step and may include many samples not needed later on. 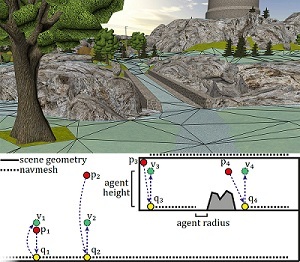 Therefore, in this paper, we propose a novel approach to precompute visibility information based on navigation meshes, a polygonal representation of a scene’s navigable areas. We show that with only limited precomputation, high accuracy can be achieved in these areas. 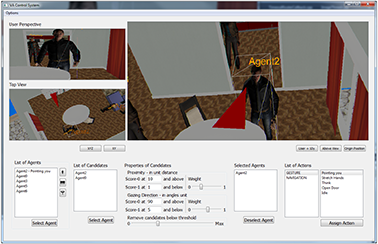 Furthermore, we demonstrate the usefulness of the approach by means of several applications, including viewpoint quality computation, landmark and room detection, and exploration assistance. In addition, we present a travel interface based on common visibility that we found to result in less cybersickness in a user study. Micro aerial vehicles (MAVs) are strongly limited in their payload and power capacity. 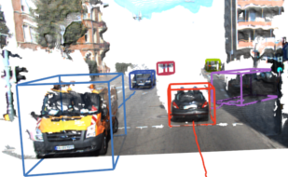 In order to implement autonomous navigation, algorithms are therefore desirable that use sensory equipment that is as small, low-weight, and low- power consuming as possible. In this paper, we propose a method for autonomous MAV navigation and exploration using a low-cost consumer-grade quadrocopter equipped with a monocular camera. Our vision-based navigation system builds on LSD-SLAM which estimates the MAV trajectory and a semi-dense reconstruction of the environment in real-time. 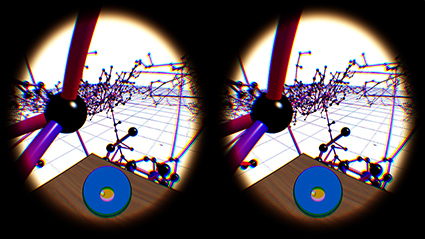 Since LSD-SLAM only determines depth at high gradient pixels, texture-less areas are not directly observed. 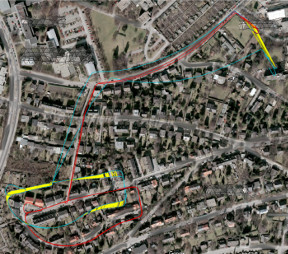 We propose an obstacle mapping and exploration approach that takes this property into account. In experiments, we demonstrate our vision-based autonomous navigation and exploration system with a commercially available Parrot Bebop MAV. In this paper we propose a novel approach to identify and label the structural elements of furniture e.g. wardrobes, cabinets etc. 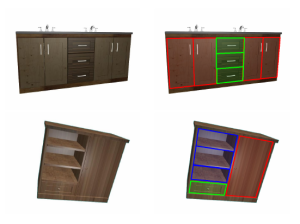 Given a furniture item, the subdivision into its structural components like doors, drawers and shelves is difficult as the number of components and their spatial arrangements varies severely. Furthermore, structural elements are primarily distinguished by their function rather than by unique color or texture based appearance features. It is therefore difficult to classify them, even if their correct spatial extent were known. In our approach we jointly estimate the number of functional units, their spatial structure, and their corresponding labels by using reversible jump MCMC (rjMCMC), a method well suited for optimization on spaces of varying dimensions (the number of structural elements). Optionally, our system permits to invoke depth information e.g. from RGB-D cameras, which are already frequently mounted on mobile robot platforms. We show a considerable improvement over a baseline method even without using depth data, and an additional performance gain when depth input is enabled. 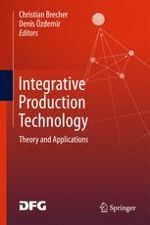 The research area Virtual Production Intelligence (VPI) focuses on the integrated support of collaborative planning processes for production systems and products. The focus of the research is on processes for information processing in the design domains Factory and Machine. These processes provide the integration and interactive analysis of emerging, mostly heterogeneous planning information. The demonstrators (flapAssist, memoSlice und VPI platform) that are Information systems serve for the validation of the scientific approaches and aim to realize a continuous and consistent information management in terms of the Digital Factory. 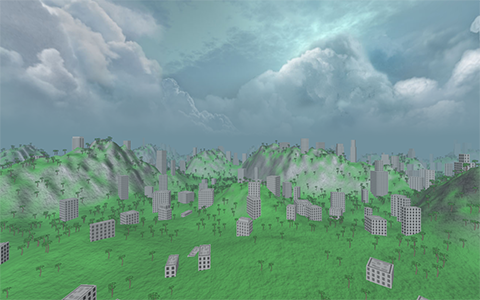 Central challenges are the semantic information integration (e.g., by means of metamodelling), the subsequent evaluation as well as the visualization of planning information (e.g., by means of Visual Analytics and Virtual Reality). All scientific and technical work is done within an interdisciplinary team composed of engineers, computer scientists and physicists. 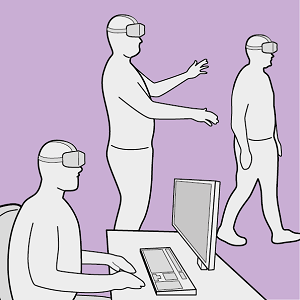 The bachelor thesis’ aim was to develop a framework allowing to design and conduct virtual-reality-based user studies gaining insight into the concept of personal space. TL;DR: Explorative paper. 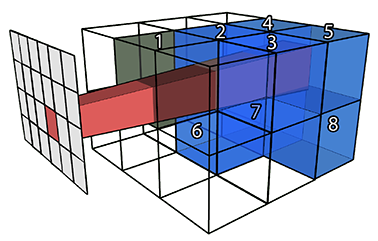 Learn a Triplet-ReID net, embed the full image. Keep embeddings of known tracks, correlate them with image embeddings and use that as measurement model in a Bayesian filtering tracker. MOT score is mediocre, but framework is theoretically pleasing. 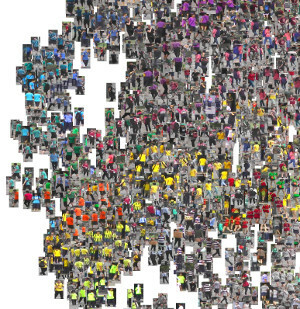 With the rise of end-to-end learning through deep learning, person detectors and re-identification (ReID) models have recently become very strong. 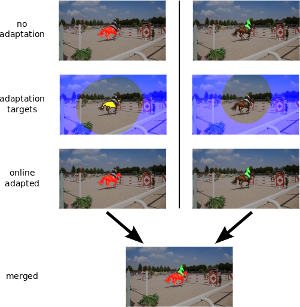 Multi-camera multi-target (MCMT) tracking has not fully gone through this transformation yet. We intend to take another step in this direction by presenting a theoretically principled way of integrating ReID with tracking formulated as an optimal Bayes filter. This conveniently side-steps the need for data-association and opens up a direct path from full images to the core of the tracker. While the results are still sub-par, we believe that this new, tight integration opens many interesting research opportunities and leads the way towards full end-to-end tracking from raw pixels.